This goes for any members involved with their local shows/events. As you may or may not know we have a calendar on the site located via the menu bars at the top or the usual way you view the menus on mobiles. Within the calendar you are able to include calendar events this is perfect for promoting any upcoming shows within the calendar year. All you have to do is go to the calendar and create a new avent and fill the details including the event date etc. along with the event details. Once you have clicked save event your event will then appear on the block at the side of the forums (on pc/tablets etc.) on mobiles this will appear at the very bottom below the forums/who is online etc. 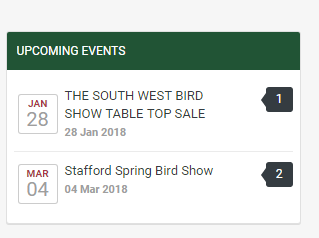 You can still include your event within the show forum, however just posting in the forum means your missing out on highlighting your event much better and possibly missing out on more potential members seeing your event which could encourage more members to your events?